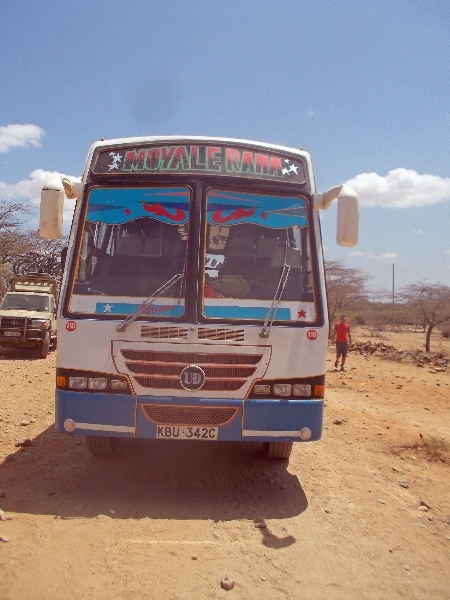 Today was second part of our bus adventure as we skipped ahead to town of Nanyuki. As described in yesterdays post, Kenya hold national elections tomorrow. We expect things to remain peaceful as those results are announced but have taken precautions to watch out the results before continuing the cycle trip on the road. We’re in a nice town of Nanyuki on slopes of Mount Kenya. Next few days will explore this area further. Today the bus ride was 350km, but fortunately only ~120km of this was on very rough roads. Some of this is a mixed blessing as it would have been some challenging cycling to ride the first bit on rough pavement. What surprised me today was how much the landscapes changed. It definitely feels like we’re not in northern Kenya anymore but now in a more prosperous, less tribal and more lush part of the country. Initially from Marsabit we came around bend into some rough roads and just a few km down the road came past two elephants grazing off to the left. The landscape gradually became drier and drier again. Road was still rough and took us almost two hours for the first 50km where we made our first stop. A small village, desert oasis. Election posters were up but one of the locals was willing to explain several things: this was tribal and this village (and tribe) was voting for the ERP candidate who they saw as leading. In addition to ERP there was “Cord” coalition and some smaller parties as well. He thought tribal didn’t make the most sense – but this is how it was. When I mentioned I was from USA, he asked if we were similarly tribal (my answer, no the politicians fight over other things). He also noted that Obama’s father was from Kenya, though from a different tribe than his tribe. After our desert stop, we continued on rough roads to Liamisis just shy of 100km. Again still dry area though slightly larger town. We came through town and stopped for lunch. Here were more people in Masai tribal dress. We saw a pair of ostriches along this part of the route. Fortunately about 15km after Liamisis we came to new paved road and our speed increased. In addition to the road getting better, the area soon became more lush and more developed. By Isolio there was enough change with crops such as corn and later wheat beginning to appear. Shops looked more prosperous, more people but not as much election stuff in proportion. We also started a climb from here slowly in the bus as we drove up to Nanyuki.